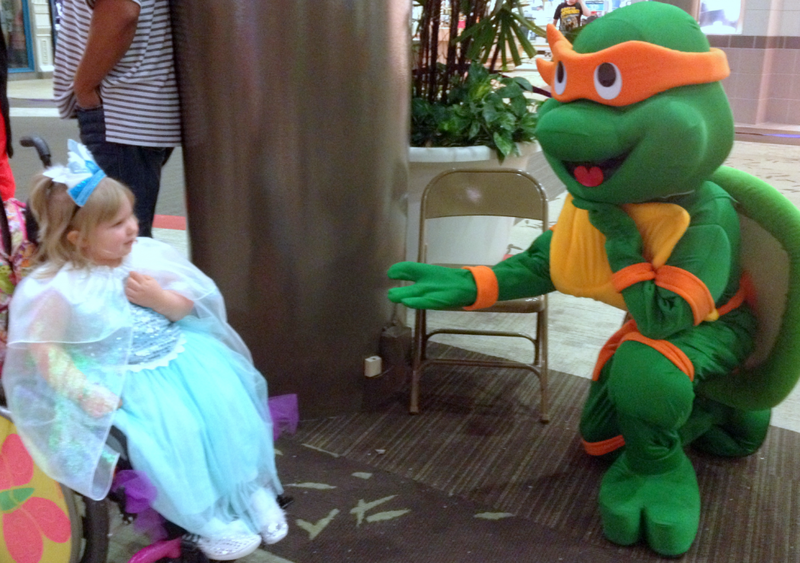 Rhema was able to attend a charity event where she got to dress up and meet many, many Characters and Princesses and all proceeds went to the Leukemia Society. Rhema picked out this new Elsa dress that I bought her a while back and she especially wanted the cape– it made her a Super Princess, she told me! LOL! Last year was our first year and Rhema mainly hid her face due to all the noise and people. This year she did so much better! There where times where she would daze, and focusing was hard, but all in all I could see a huge improvement in how she handled all this sensory over load. Believe it or not this was the one Character after we left that Rhema talked about the most. I think she liked his mask and she LOVES turtles. LOL! And today, while at a thrift store, I finally found a chair for her to sit in with her booster seat at home and guess what else I found– a little ninja turtle toy that had an orange mask!!! I thought, what a kiss-from-the-Lord to find such a toy with the exact same color mask! I gave it to Rhema tonight and she has played with it all night!! LOL! A Cowboy & A Space Man! Rhema was fascinated with the “Space Man” and then she loved the cowboys hats too! Okay, so when I told her where we were going all she talked about was Mickey & Minnie. 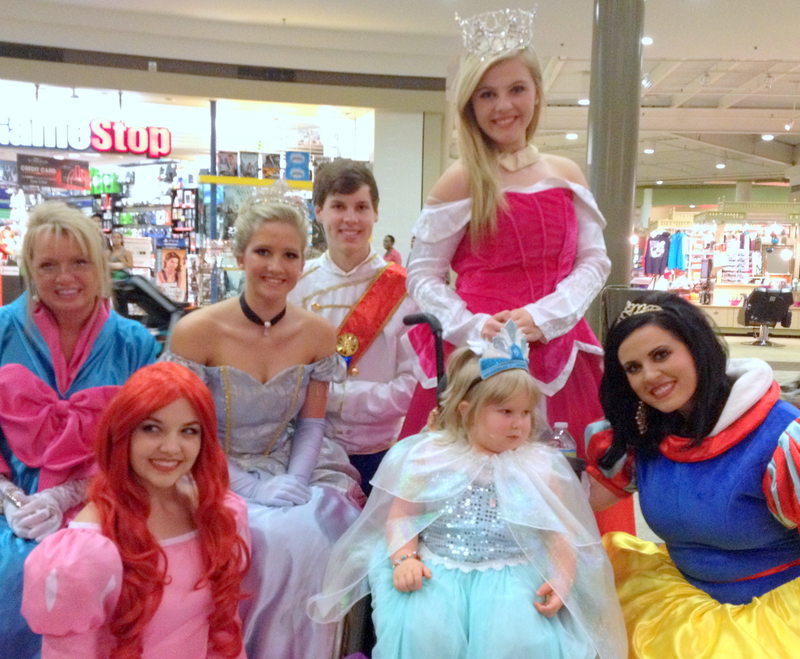 Rhema was so excited that they would be there! As we drove over there I kept up my talk about all the kids and people that she would encounter (I try to prep her as much as possible before any big event) and told her she could give Mickey a “high-five”. So, from the back seat I hear, “no, not a five, a HUG.” I was so shocked to hear her say she wanted to hug Mickey. 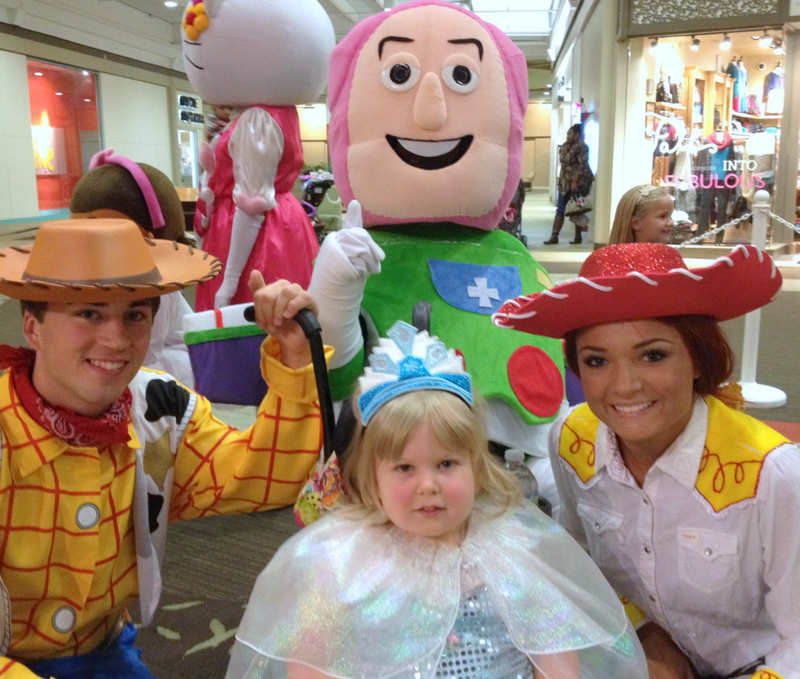 Oh, I prayed the whole way there that even in the heightened sensory environment she would get her moment with Mickey; that her brain’s overload would not rob her of this experience. We stood in line for almost 45 minutes and when we were allowed in with the all the Characters the lady said to go see the ones you want to see the most first as they were closing up soon. We made a bee-line for the Mouse and I coached Rhema verbally all the way. We finally got up to the area where Mickey and Minnie was and Rhema just stared at them. I leaned over and said to them that they were the two folks she had talked about all day and wanted to give them a hug. 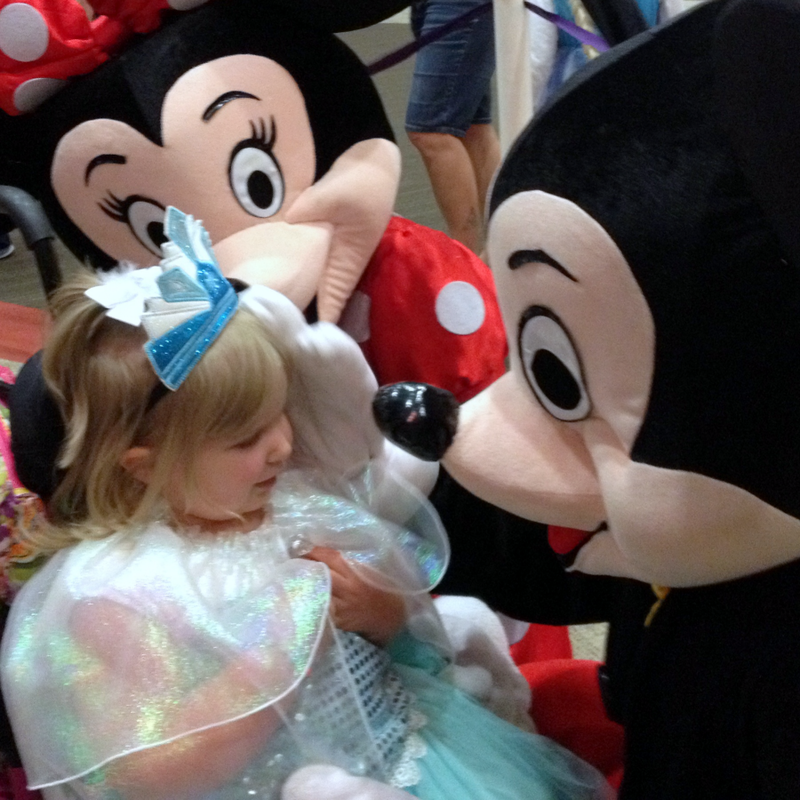 Both Minnie and Mickey knelt down and slowly approached her so gently. 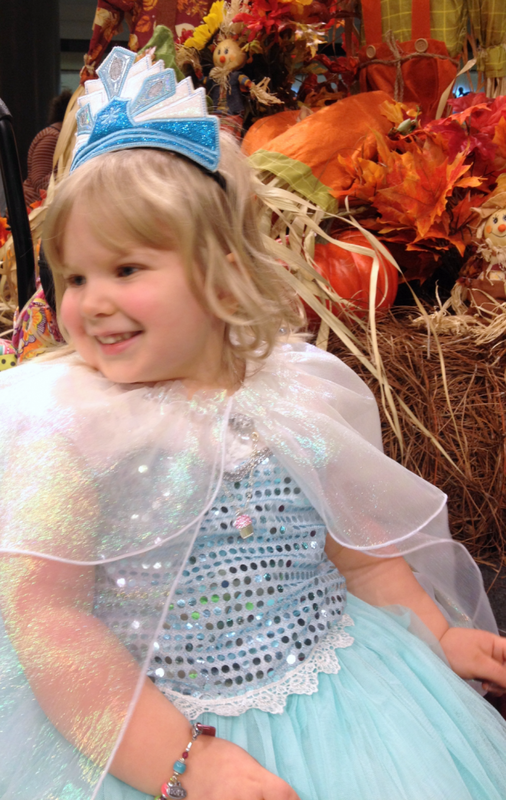 Rhema continued to stare, but did not roll backwards in fear like she did the year before. Minnie pet Rhema’s head and then Mickey slowly moved closer and then gave Rhema the sweetest hug. Oh, I was almost in tears. Rhema let them get real close to her and hug her!!! 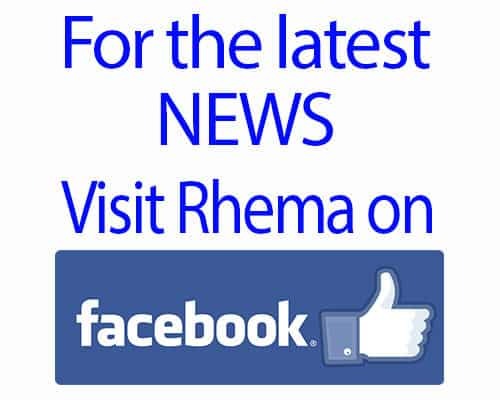 And Rhema began to smile some and then began talking about their noses. Huzzah! I was so happy to see Rhema got her “moment” and did not freak out. It was a real special moment. OH, and she wore her crown all night!!!! That was a huge thing as she does not do well with headband-like things. She even wore it after we left and went for a bite to eat! 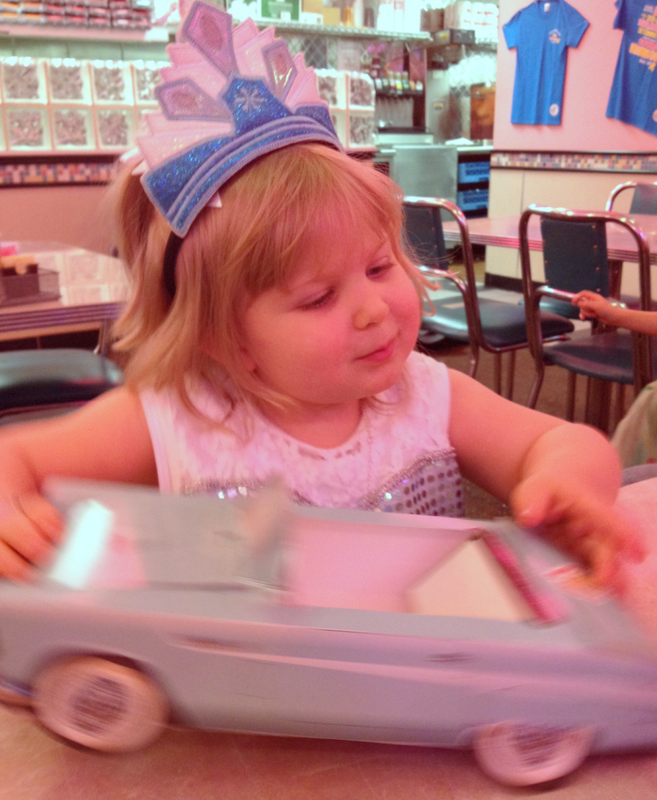 I loved this picture of her playing with her car (that her food came in) and still wearing her crown! Yup, that’s our Princess! Come On In, The Corn Is Fine!